Every year that goes by, it gets harder to remember where we traveled. So, I like to end the year by making a map that I can share using Google Maps. I’m not going to cover how to plan travels and change the destinations or routes. I’m also not going to cover making custom markers with your specific information, there is a video for that. In this article, I just want to show how to create a quick and easy map of all your travels for the year, save it, and share it with others. The first thing to understand in Google Maps is the difference between ‘Get Directions’ and ‘My Places.’ Get Directions is just a tool, what you see is temporary and will be wiped out when you ask for the next directions, or move to another web page. My Places is where the maps you create are saved to your Google Account. Be sure you are logged in with the appropriate account. The quickest and easiest way to create a map to save is to start with the Get Directions, then save the resulting route to a ‘My Places’ map. Let’s say that you started your summer travels from Corpus Christi, Texas, then traveled to the west coast via the Grand Canyon. 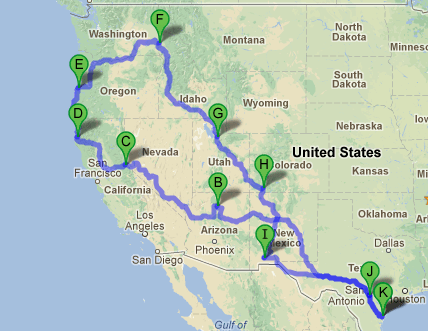 You traveled up the west coast a ways, then back east thru Idaho and eventually south, returning to Corpus Christi. 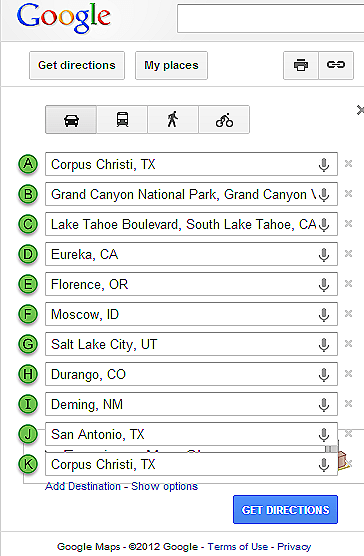 You can enter every major stop as a ‘Destination’ in the Get Directions portion of Google Maps. It starts off giving you two fields, one for your starting point, and one for your destination, but you can keep adding destinations to your heart’s content. When you have enough entered, you can click the Get Directions button. There are several ways now to share this map. You can send a link to someone by clicking the link icon and copying the URL provided. 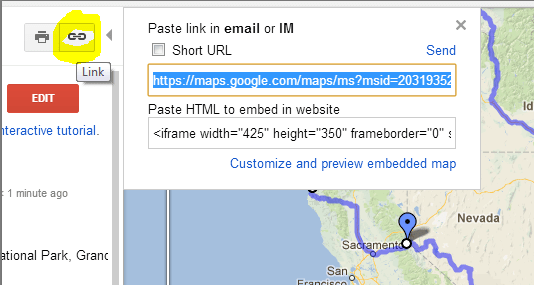 Or you can embed a live copy of the map, also by clicking the Link icon, then copying the code for Embedding. 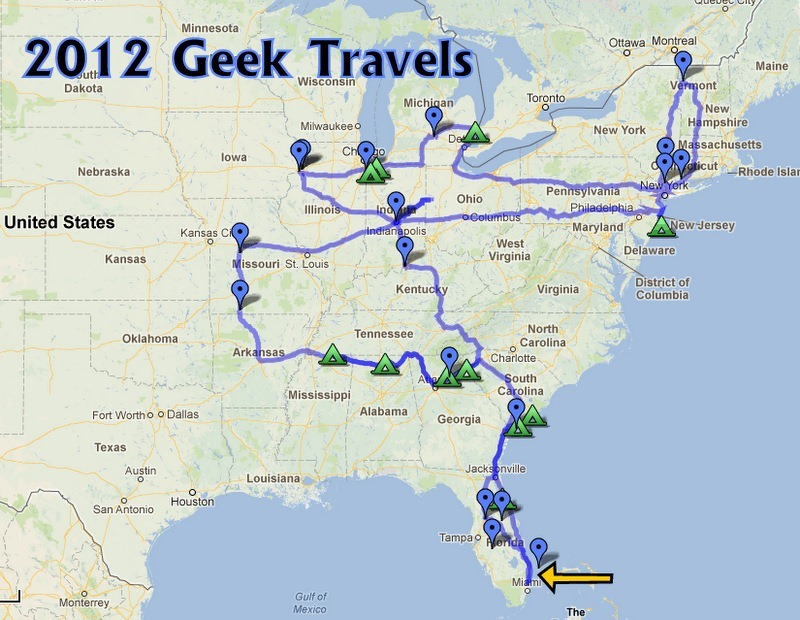 Geeks on Tour members can watch a video on how to embed the map into a blog post. The simplest way to share this map is just to take a screenshot of it. You can use the Snipping tool in Windows 7, or Command-Shift-4 on a Mac. But, my favorite way is to use Picasa – just press the PrtSc key and Picasa grabs the screen, then you can crop it and even add text like in my ‘2012 Geek Travels’ above. The end result is just like any other picture, you can share it on a Picasa Web Album, or on a Facebook or Blog post. And, if you keep your map in something other than Google Maps, you can still use the Picasa Screen Capture technique to grab it and share it. If you do this, we’d love to see it! You can upload the picture of your 2012 travels to our Facebook page! Just click in the space provided to ‘write something,’ click the Photo/Video link and select your map picture to upload. Published by MrsGeek, in Blog. Tagged with Get Directions, Google Maps, Picasa Screen Capture, Save My Map. We’ve often wondered how to do that, but just never took the time to generate one. We wish you, Jim and Odie, a wonderful HAPPY NEW YEAR…..